It was free-dress day at school. I chose to wear an oxford shirt, my brother’s tie (which I woke up my dad to tie for me), a v-neck khaki sweater, and dark wash skinny jeans. The kids had their jaws on the floor. Some told me I look like a boy. One student said I looked LIVE (“on-point”, “stylish”)! My style this year has changed quite a bit from when I was in college. 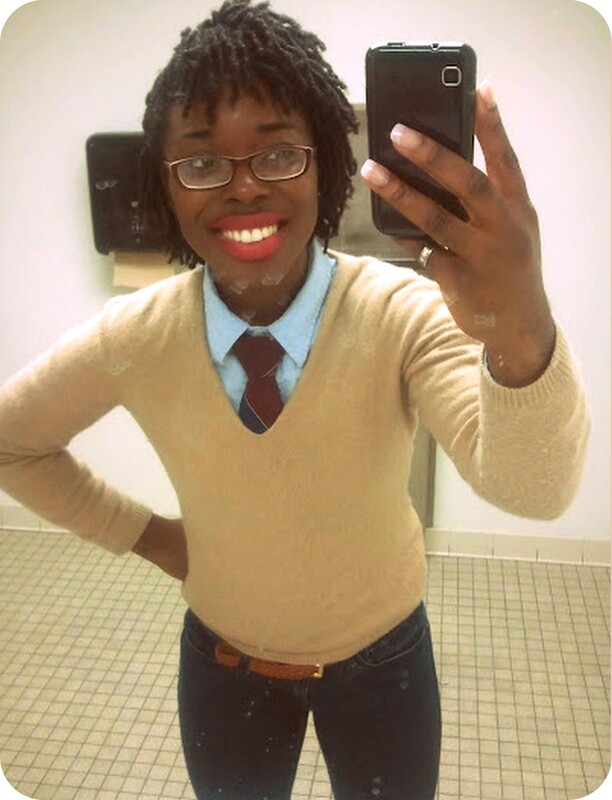 When I first went natural, I had a slightly androgynous style. I was obsessed with mens vests and ties. That paired with a teeny wee afro and red lipstick made for some interesting moments! Since then, I’ve become decidedly more feminine-looking, or at least I think. Lol.